Rocketdyne LOx/LH2 rocket engine. Ares I launch vehicle second stage. In development 2006-2016. Began as an update to the J-2 engine of the 1960s, but final design was all-new, 20% more thrust, but double the weight. Status: In development 2006-2012. Date: 2012. Thrust: 1,310.00 kN (294,490 lbf). Specific impulse: 448 s. Burn time: 431 s. Height: 4.70 m (15.40 ft). Diameter: 3.05 m (10.00 ft). The J-2X concept can be traced back to 2005. It began as an update to the J-2S, a simplified version of the J-2 used on the Saturn launch vehicles. But by the time NASA and its subcontractor had studied the design, applied "essential" current technical specifications, materials, and standards, they wound up with a design with 20% more thrust, 3% greater specific impulse, but nearly double the weight of the original. The J-2S had been developed and tested in the early 1970s for follow-on production runs of the Saturn IB and Saturn V launch vehicles. It was shelved after further production was cancelled. Some J-2S hardware was revived for use on the J-2+ linear aerospike engine for the X-33 in the 1990's, but this was also cancelled. It should be noted that the J-2X designation was also used for the J-2 technology program conducted in 1964-1967 that led to the J-2S. As a "risk reduction" measure, NASA originally decided to develop two variants of the engine, designated J-2X and J-2XD. The J-2X would be developed first, for the Ares I upper stage and low-earth orbit operations. It had a lower combustion chamber pressure, using gas generators for the turbopumps derived from the original J-2 engine, and had a nominal thrust of 1220 kN. The J-2XD would be developed only after the J-2X development was completed (perhaps never if basic J-2X performance was acceptable). It would have a nominal thrust of 1310 kN, achieved by using a higher chamber pressure and a modification of the gas generator designed for the RS-68 engine that powered the Delta IV. Both engine versions used of the Mark 29 gas generator cycle series turbopump design developed for the J-2S and further developed in the 1990's for the J-2+. The turbine exhaust gas would go into the nozzle, augmenting thrust and also providing film cooling to the nozzle extension. The main injector was of a new design, but contained coaxial elements similar to the J-2 engine. The main combustion chamber had a copper liner with milled channels and a HIP-bonded jacket using methods developed for the RS-68. 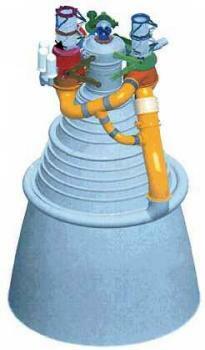 The two-part exhaust nozzle used Volvo Aero technology developed for the Vulcain engine that powered the Ariane 5. The regeneratively-cooled upper nozzle used a patented Volvo Aero sandwich design. The lower nozzle extension was cooled by supersonic film injection of turbine exhaust gases, developed for the Vulcain 2 engine. The regeneratively cooled nozzle had the same 40-to-1 expansion ratio as the J-2S. The nozzle extension increased the expansion ratio to 80:1 and this larger expansion ratio was the main contributor to the engine's high specific impulse. The ignition system consisted of an augmented spark igniter similar to the J-2 design, but incorporating improvements derived from the Space Shuttle Main Engine. The J-2X used J-2 valve designs updated for NASA's 2006 seal materials and structural requirements. A few heritage actuators were used where feasible, but most were new or modified to incorporate NASA's 2006 fault tolerance requirements. The J-2X incorporated a new digital engine controller designed to meet fault tolerance and failure detection, isolation, and recovery requirements. The system used open-loop controls to ensure that the design was as simple as possible. Even with these substantial "modifications" to the original J-2 design, the J-2X was still found to vastly cheaper and less risky than the original concept of modifying the Space Shuttle Main Engine for in-flight restart. The J-2X for the initial Ares I application could be relatively simple - it might not even have to be restartable. However for the Ares V lunar mission Earth Departure Stage the engine would have to be restarted after loitering in Earth orbit for up to 95 days. This would require development of new-technology methods of reliquefying boil-off of the stage's cryogenic liquids, and elaborate thermal protection systems to handle the more extreme conditions. Development began in October 2005 with the assumption that a derivative of the Shuttle SSME would be used for the Ares I upper stage and a J-2 derivative for the Ares V Earth Departure Stage. By January 2006 the launch vehicle configurations were refined to drop the SSME on cost grounds, and use the J-2X in both stages. A J-2X Upper Stage Engine Element Office was created within NASA. They convened a 'grey beard' team of surviving J-2 engineers from the Apollo era to discuss historical problems with the engine and suggest possible design approaches for improvement. The team also provided a valuable list of "lessons lived' during the Apollo era in testing, hardware evaluations, engineering fixes and problem-solving approaches. The Preliminary Requirements Review of the conceptual engine design and development planning was completed in June 2006. Testing of subsystem components using modifications of existing hardware began as early as April 2006, and a full-scale version of the new injector was to be completed and begin testing in 2007. The original program plan called for the Preliminary Design Review in May 2007, followed by the Critical Design Review in May 2008. The first production-type article would begin testing in 2010, leading to Design Certification for flight in 2012. However the program ran into major delays. By the fall of 2008 critical decisions on the materials for the nozzle had not yet been made, and the J-2X looked like the long pole in the tent, the critical item that might delay first manned flight of the Orion spacecraft into 2016. Engine: 2,430 kg (5,350 lb). Area Ratio: 80. Oxidizer to Fuel Ratio: 5.5. Restarts: 3. Country: USA. Propellants: Lox/LH2. Stages: Ares I-2. Agency: Rocketdyne.